You have almost certainly heard about the Graze snack box subscription service over the years. Originally they provided people with a box of four snacks, where being able to choose dietary requirements was pretty limited, but now as well as having control over the snacks you can possibly receive you can also buy them in bulk. I have never bought graze snacks in bulk but I would have to presume that they still come individually wrapped as otherwise the purpose is somewhat defeated as people often struggle to portion out this sort of snack and it would reach a point of them not being too healthy and also causing additional expense. So recently I decided to try them out again after several years since my last box. I am actually allergic to various types of tree nut, ground nut, peanuts, beans, seeds and soy but I also have a huge weak spot for some of these things and I generally know my limits on each type of thing and how to avoid getting a pretty bad reaction from them. Therefore after I had de-selected the things I could not eat the list of things they could send me was looking pretty pitiful so I had a look through and altered my preferences based on what I knew was safe for me. The Graze Gods were clearly not looking kindly on me though as three of the four snacks contain things that I am technically allergic to and therefore I had to be extra careful and spread the snacks out much more than I otherwise would have wanted to. As we delve into each snack I will let you know whether the blotchy, swollen face or the itchy body was worth it or not. I was equally excited and also nervous about this snack. it is the sort of thing I love as it has some texture and a bit of spice too but they are the exact reasons that it made me nervous. Luckily the spice levels were not that high at all and instead just helped to take away the plain tastes of the roasted and toasted crunchy items. But the texture was quite difficult for me to handle. Not because they were difficult to eat or any of it was ‘wrong’ but rather because they really were rather crunchy. I have food issues and the sound of my own eating, or worse the noise of another person eating, can stop me in my tracks, put me off my food and make me want to throw up. It can also make me pretty irrationally angry. So these snacks pretty much deafened me and made me super agitated which was not great as I was about to board a five hour coach journey. They were tasty and super yummy but the fact I could hear my partner chomping them over the announcements and all the hustle and bustle around us suggests that in a quiet office or home environment these would really really stress me, and possibly others, out. Luckily for me though the broad bean is a bean that I am much less allergic to than some other types and I did not notice any reaction to this particular snack; not that it matters as I have no intention of getting these again. I should really stop getting excited about things in advance, especially when it comes to food. How I have not got it into my head yet that building myself up for food and the greatness of it will only lead to disappointment? But c’mon this is honeycomb flapjack and I could not wait to have those little bursts of sweet honeycomb come through the moist (sorry), soft and fresh oaty goodness that was topped with some delightful looking shiny chocolate. If you like flapjack then it clearly sounds like it should be good and exciting and tasty, right? It was far from the best flapjack I have ever tasted. I have had better 20p off the shelf, in a foil tray, flapjack than this. 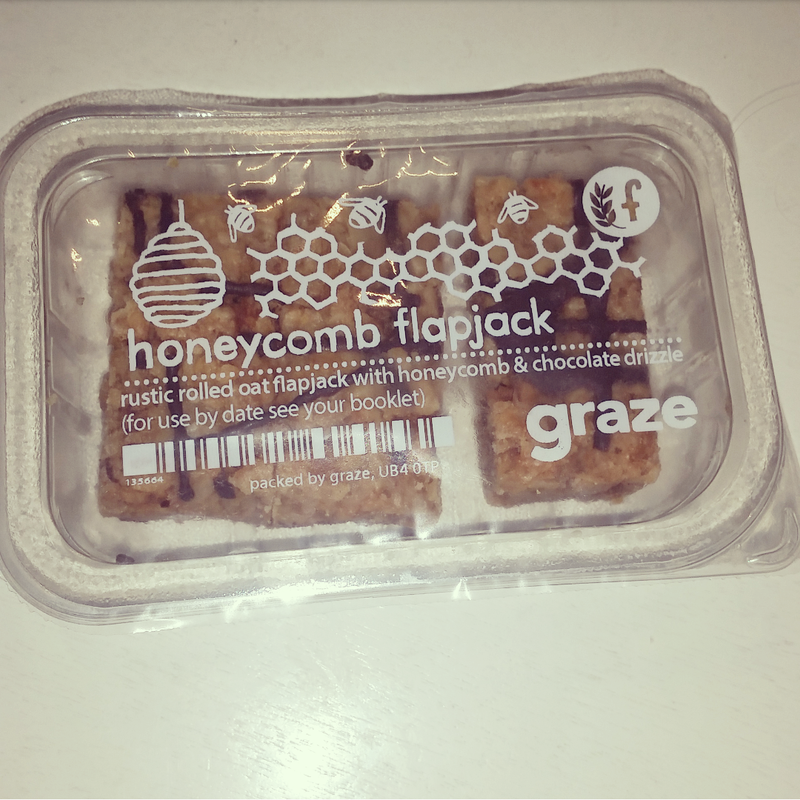 It was dry and lacked the taste of even a standard piece of flapjack let alone one that had honeycomb in and chocolate on. if I eat something that is clearly not that healthy, however it is portrayed, then I want it to taste good and make me feel that the calories were actually worth it not just eat something and feel a void of dissatisfaction afterwards. At least there was nothing in this one that I was allergic to though so I knew after I had eaten it that I was not going to then also have to deal with a reaction for eating the blandest piece of flapjack the world possible may have ever seen. Dark chocolate, juicy looking cranberries and a little burst of pumpkin seeds not only look fantastic in the packet but it also sounds like a good well rounded tasty combination. The pumpkin seeds and the chocolate buttons were both a little bashed up and the seeds had caused scratch marks on the chocolate making it look a little less appealing but that is just a minor appearance fault and would of course in no way affect the flavour. Pumpkin seeds are pretty much the same regardless of where you buy them or if they come in a pack like this. There is only so much that can be done to a pumpkin seed naturally or artificially to make it a little less dull. So as long as they were combined with something else in the box I did not mind them at all but when I discovered I had got the ratios a bit wrong at the end then they did become a bit of a chore to eat. Sure I want a healthy snack as much as the next person but I also want it to be tasty and exciting because seriously who has the time to sit and eat dull food? The cranberries were amazing though as they were super juicy and had a lot of flavour stored away in them which really helped to make this box a little more exciting and have a variety of flavours rather than the expected baseline ones. If all cranberries in my life could be this good then that would be fantastic. Regards the dark chocolate it was pretty much what you would expect in the sense of it not being the best stuff that you could possibly get yet hands on. it lacked the depth of flavour that quality dark chocolate does and I felt that this really made the box lack that overall complete taste sensation that it could have ultimately brought. I get that graze wants to make a profit and provide things to people for the biggest margins possible but the lack of quality in the chocolate really made this a let down for me and made me question how much Graze actually care about quality and satisfaction. I actually reacted pretty badly to this box and it served as a good reminder as to why pumpkin seeds are super bad and they would not exist in a world that I had the ability to create and alter. This particular snack could have been absolutely fantastic but almost every element missed the mark or did not merge well with the others. I saved this one to last to talk about because I absolutely love peanut butter. Peanuts are one of the first things I realised I was allergic to and looking back it was really obvious that was the case but I love peanuts and there are few things that are going to come between me and a peanut product. So when this popped up I obviously said I would be fine for it to be included. The packet says rough blend and that is certainly what this is. I thought that perhaps that meant it would be similar to crunchy peanut butter but slightly smaller chunks but instead it was just full of loads of tiny little specks that managed to keep making me choke on them and cough A LOT. It did not even taste that good and I have had a lot of supermarket own brand peanut butters that taste better than that (I have also had natural and organic ones that taste a lot better too so Graze cannot use those qualities as an excuse for this product). Can we also talk about how unappealing this looks as a snack. If I had Graze as a product to take to the office and eat when I got the munchies this is one of those snacks I would either keep at home or try to hide under my desk. It looks disgusting and it did not invite me to come along and eat it. They would have also done better if they had just called the ‘apple crisps’ dried apple as to me a crisp at least has an outer crunch or bit of texture initially even if it does not go within or through the entire thing. These were just dried and soft in that chewy way where you are still battling your way through it what feels like hours later. The fact there was no crunch in the crisps meant that combined with the peanut butter it was just a bit of squidgy sloppy mess. So I ended up with a blotchy and swollen face for something that I thought I was going to love but instead turned out to be the only peanut product to date that I would turn down in the future. Seriously, it was that bad. If you want to find out more details about Graze, their subscription boxes and their shop they can be found here. Most Graze boxes are £3.99 but some can be a little more, depending on your specific selections, and delivery is generally free of charge. This entry was posted in Food and Drink, Product Reviews and tagged comfort food, eat, eating, family, Food and Drink, food blog, food blogger, food bloggers, food costs, food image, food pictures, food product, food review, foodie, friends, healthy eating, healthy living, lblogger, lbloggers, Lifestyle, lifestyle blogger, lifestyle bloggers, office, on the go, simple food, snack, snacks, tasty food, work. Bookmark the permalink.